VISTA, Calif. - Feb. 17, 2019 - PRLog -- As a celebration of Women's History Month, the Women of Influence Awards recognize women who lead the way in business, industry and enterprise, along with the organizations and individuals that champion women leaders! 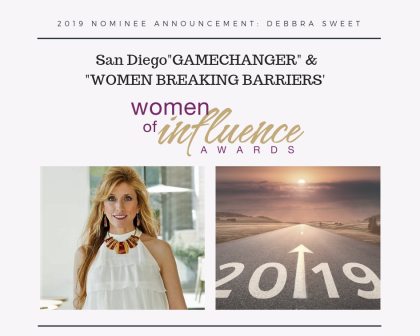 New York Times bestselling author and award-winning leadership performance coach, Debbra Sweet, said flying head first into a concrete wall at age 18 saved her life and the subsequent 30-year fight to overcome significant health disruptions fueled her victories. Today she leads with cutting-edge insights on how to overlay subconscious change, neuroscience and business growth strategy skill sets; strategically trailblazing how we learn to do life in business and triumph along the way. "Nominees like Debbra Sweet are setting the standard for innovation, resilience, creativity, and excellence in leadership," said Marcy Browe, of Marcy Browe Photography. "It is an incredible achievement for Debbra to be selected among the best of women leaders for this award." As a nominee, Debbra Sweet, is eligible to win from two categories of nomination. The "Gamechanger" award recognizes a woman who has made significant contributions in their profession, industry or enterprise with a track record of change, innovation, inspiration, accomplishments and/or achievements. The "Woman Breaking Barriers" award recognizes a woman who has utilized her position, stature, expertise and influence to break down barriers and effect positive change in her profession, industry or enterprise. Debbra Sweet is an award-winning business development and leadership performance coach based in San Diego, CA, USA.